Artisan baking is on the rise. Take that as a pun if you wish, but the fact is the industry is trending toward artisan (that is, handmade) baking. Instinctively, when someone hears a bakery exclusively creates handmade bread, it’s safe to assume the bread tastes and is better than machine-made bread. In fact, “artisan” has come to mean “quality” in many customers’ minds. Bakers are earning reputations as craftsmen with their artisan creations, and even national franchises and grocery chains are marketing artisan products. And that’s why the quality of artisan baking ingredients is so vital. When customers come in expecting quality handmade bakery products, the proprietor needs to deliver. Without the best artisan bread flours, baking supplies and ingredients, customers can leave disappointed, and that’s not good for anybody. Customers want old-world bread and bakeries want to give it to them. Talk to the owners and bakers at any artisan bakery, and they’ll tell you the most important part is the ingredients. 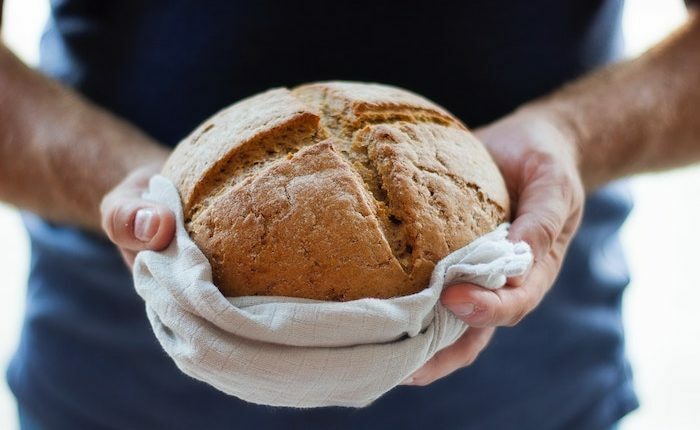 Whole grain flours, sugar, shortening, fillings and toppings—everything a baker may need for bread, pastries and other items—have to be the best. When customers open the door to a bakery and are engulfed by the appetizing smell of fresh, handmade bread, the saliva glands work extra hard. Everything looks good. It’s the aroma, the aura and the history of artisan products that make the perception of quality so strong. In order to keep that perception where it belongs, especially as it continues to permeate the mainstream, artisan baking supplies and artisan baking ingredients need to be the best. What’s your favorite artisan bakery? Can you name one or two? Now think about why it’s your favorite. We’re willing to bet it comes down to the ingredients. There is a small bakery on the southwest side of Grand Rapids, Michigan with eight employees. They are open six days a week and have been proud to say they bake all of their pastries fresh. They are proud of the hard work they put in each doughnut and scone and they’re proud to say they use the best ingredients, the freshest grains and highest quality oils. That is why we are proud to serve them. A lot of things have changed for Bremer Authentic Ingredients since we were a small sugar supply company 65 years ago. Now we sell a lot more than sugar and we serve companies all around the Great Lakes. One thing has not changed. Our commitment to serving our customers, big or small. We pride ourselves on offering them competitive prices on high-quality ingredients. Over our time serving these small bakeries we found that they take more pride in what they bake, they know the recipes and most of all they know that they need the best ingredients. From a small mom and pop bakery, to a big commercial food producer – you can use the same ingredients. From one bag of sugar to a tanker of sweetener, we have you covered. We are passionate about the ingredients we sell, just as you are about the great tasting products you produce. Thank you for letting us be a part of your successful business and let us know how we can better serve you. Salt is in almost all of your favorite foods and, if it’s not, there is a good chance there is a salt shaker nearby that will help change that. However, with growing concerns about how high-levels of sodium can be detrimental to our health, many of us are looking to cut back on our sodium intake. Focusing on the food production and baking side of things, here are some tips for understanding sodium and what you can do to reduce usage and intake in your products. Salt is 40% sodium 60% chloride based on weight, and it does more than simply make your french fries taste better, it is also one of the world’s oldest preservatives, it adds texture and tenderizes cured meats, and even controls fermentation of our favorite baked goods. Yet, even with all of the benefits of salt, studies have shown that high-sodium diets have been associated with high blood pressure, heart disease and strokes. To give an idea of how this salt craze has gotten out of control, the USDA says we should intake no more than 2,300 milligrams of sodium daily and the average American takes in roughly 4,000 milligrams – nearly double the daily maximum. With this high level of salt usage in America, what are real ways that we can, as food producers, really make changes to how we make food and educate consumers? Here are a few sodium reduction tips that will go a long way. Understand Where the Salt Comes From: Just because salt isn’t in the list of ingredients doesn’t mean that it isn’t in the product. Any meat and many vegetables have sodium in them naturally. This should be factored in to whether or not you decide to add any additional sodium into the recipe. Know the Labels: This goes both for consumers and producers, understand what labels are on products. Sodium Free contains 5 mg of sodium or less, Very Low Sodium contains 35 mg or less, Low Sodium contains 140 mg or less, Reduced Sodium means the product’s usual level of sodium is reduced by 25% or more, and Unsalted or No Salt Added means it may contain sodium but none was added. Are you interested in low-sodium alternatives for your products? Know Your Alternatives: There are ways to reduce sodium levels in a product that doesn’t necessarily change the flavor of the product like adding potassium chloride or other flavor alternatives. Even soy sauce, while it has sodium in it, there is less sodium than there is in natural salt. You can also simply reduce the amount of salt used in a recipe – while this may change the flavor of the recipe but you might find that you can reduce sodium by a large amount without really sacrificing taste. All of these things will help you reduce sodium intake, and help in making products that are healthier for your customers. Consider low sodium or salt alternatives like Cargill’s SaltWise system which can reduce sodium levels between 25 and 50 percent, while still giving your foods great flavor and salty taste. We also have a full selection of Cargill products in their FlakeSelect™ line that you can use to maintain the full salt flavor but reduce the actual level of sodium. The FlakeSelect™ portfolio includes a FlakeSelect™ KCI/Potassium Chloride, FlakeSelect™ KCI/Salt, FlakeSelect™ KCI/Sea Salt and FlakeSelect™ Salt. The two types of salt look different, taste a little different and definitely feel different – but the chemicals that make them up are the same. So what is the difference between sea salt and table salt? And maybe the bigger question for our customers, how can they be used differently. Sea salt and table salt both have the same chemical makeup – Sodium Chloride (NaCl), and for that reason they actually have the same nutritional values; even though sea salt is often seen as a more nutritious form of salt. The main difference is in how the two types of salt are produced; sea salt is made from evaporating seawater, while table salt comes from underground salt deposits and is heavily processed. This is the reason behind any sort of differences between the two types of salts – the evaporated seawater often has trace minerals or elements that add to the color and flavor of sea salt. With table salt being so meticulously processed and mined, all trace minerals are eliminated. Another difference is that table salts contains iodine – which is why it is often called “iodized salt”, iodine is not typically added to any sea salts. The reason iodine is added to table salts is because there are regions in our country, the Great Lakes region especially, where the ground has very little iodine, which is a necessary mineral for the human body. Iodine, which helps our bodies regulate hormones produced in your thyroid for metabolism, was then added to salts by many companies dating back to the 1920’s. So now that you know the differences in how they are made, here is the real question, when should you use sea salt vs table salt. While there are many reasons for using sea salt, few are actually for flavor. While people in blind taste tests did think the sea salts tasted better, they were more impressed by the sea salts appearance and texture. The sea salt grains are much larger than table salt. Meaning you can actually see the salt on top of a sweet pastry or a vegetable, many people like to see that there is salt on it. Sea salt’s large grains also give the food a crunch when biting into it which many people like. The crunch adds a new texture to the food and gives it a more gourmet appearance. However, one of the main complaints about sea salt is that it doesn’t stick as well. The large grains of the sea salt often will fall right off of a french fry for example, while table salt sticks easily to most any food. The other important thing to note is that sea salt is often more expensive per ounce than table salts, which means in many circumstances where the salt is neither seen, nor heard – if the two salts taste the same, most people will not notice if you use sea salt or table salt in your recipe so many choose the less expensive table salt. So what do you use in your recipes or what differences have you noticed between the two salts? Let us know!